On this week's show, Chris is once again fascinated by the super-heroic epics of the Chikara wrestling promotion, and Matt is trucking along with promotion for The Supervillain Handbook with the relentless precision Dr. Doom, but it's time once again to put everything else on hold so that we can review Justice League. Plus, we answer another listener question from the Ajax Mail Rocket! You have to remember, it started all the way back when Dan Waters started trying to do a Catwoman movie right after Batman Returns. That was ten years of development before I showed up, and they had just done a batch of drafts before I showed up to take my run at Catwoman to take my run at it. I got the green light draft, actually. My draft is the one Halle Berry signed on to and got the movie up and running and got a director, and then they sent me on my way. I was like "How bad could it get in the next four months before they start shooting," and really, I did not anticipate the warp speed, the almost Doppler effect of horrible that they got in the interim. They could never get away from this cat-power thing, so my pitch of 'she's a cool thief' was basically just tossed completely out. I kept hacking away at it because I wanted to be the guy who cracked it, and that's a very easy trap for writers to fall into. I often say that I wish the one thing someone had told me when I was younger was to learn the difference between a challenge and a warning. Dan Waters had once said "this movie is impossible to write," and I took that as a challenge rather than a warning. So I sank about two years of my life into trying to make the cool version of Catwoman that nobody wanted to make at all, and I admit, in the back of my mind, thinking "If I do this right, I get a shot at Batman." As soon as somebody says something, that's five thousand dollars. That's why you end up with some shows you watch, and you see the strangely mute security guard, and you're like "Wouldn't he ordinarily say 'here's your package, ma'am?'" But no, they ran out of money that week, and even on big shows you have to watch it. Little stuff like, most people don't know, any time you move the trucks in a TV show, that costs you money, so every time you change locations that aren't around one location, that just guts you. It's really crucial to find one place that you can just shoot around. Most TV shows are built around X number of days in the home base set just because of cost and ease of shooting, because those sets are pre-lit. It is not something you think of consciously after you've been doing it a while, because you internalize it. I was actually just doing something with Andy Cosby, who created Eureka and was one of the founders of Boom!, and I was writing an episode for something he was doing. We were on the phone with the executive who hadn't really made a lot of TV, and she said "Shouldn't there be two more people in this scene?" and as one, we said "No!" Because when you go from two to four, it becomes incredibly difficult to shoot. Your coverage of everybody's eye-lines, and if anybody moves, you're screwed. Two people's easy to shoot, four people... it's five to six times longer to shoot people talking. That's what I love about comics. One of the reasons I'm doing a comic on Thrillbent is that it's the big high concept TV show that people love, but nobody's been able to figure out how to afford to make it yet. So I was like, all right, I'll do it on Thrillbent and screw y'all. I'll do it here, where big special effects are free. From a genre and medium standpoint, that's one of the great things about comics. It's a pure expression of what's in your head. The purest expression of what's in your head in a visual medium is comics. Follow John Rogers on Twitter, and check out his website! Rogers and Waid's digital comics can be found at Thrillbent.com! CA loves IDW's D&D comic. Seriously. We were, however, slightly less kind to the Catwoman movie. 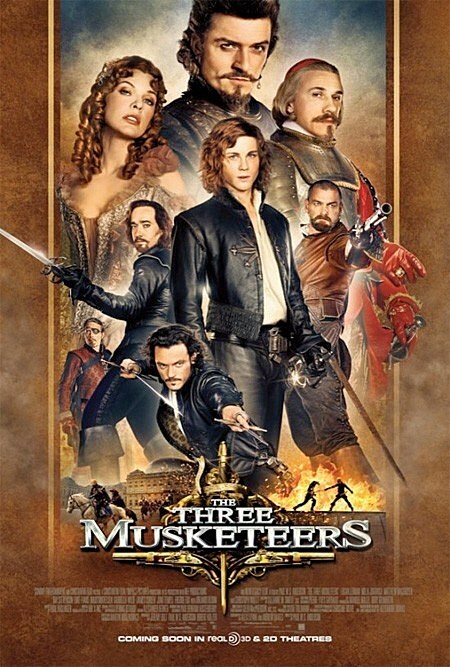 Chris's Rec: The Three Musketeers (2011). Believe it or not. Flex Mentallo Hardcover: "What strikes me the most about this comic is that there's so much going on thematically, I kind of wish I'd just read Flex Mentallo instead of Supergods, because Flex Mentallo makes the salient points that Grant Morrison makes in Supergods much more succinctly. I think the big lesson of Flex Mentallo is that when it comes to stories like this, less is definitely more." Saga #3: "If I was on the fence at all about Saga -- which, I was pretty much in for this because I'm a Brian K. Vaughn fan, I stuck with Ex Machina past the point that I probably should have -- with this issue, I feel like this series is going in a good direction. I'll be sticking with it." Justice League #9: "Up until a certain point, I thought this was the most readable issue of the run so far. I don't want to use the word 'good,' so I guess 'least bad.' We talked about this last issue: The choices of what is shown to us and what is implied or just flat-out told to us in this comic makes no sense. It is mystifying. There's a lot of drama and storytelling and action that at least sounds like it would be kind of interesting to see that we don't get to see. Instead, what we get is Batman saying he doesn't have a favorite color." "Every character in the book gets a flashback discussing something that doesn't matter or that we already know."